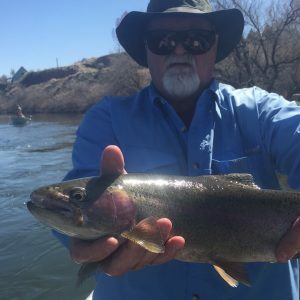 Bighorn River Fishing Guide Report Thermopolis Wyoming – The Bighorn River is still at 3000 CFS and it is nice to have steady flows for fishing right now. The river will bump a bit more to 3500 CFS when the runoff starts coming in. The Bureau of Reclamation is going to try to keep flows around these levels and it is not looking like it will be a very big water runoff year this year. We shall see what the rest of spring brings. The blue wing olive hatch is in full spring hatch mode right now, and is making for some really fun opportunities to catch fish on small bwo patterns. Weather is a big factor for dry fly fishing, but most days trout are looking up. We are catching fish on nymphs too including: sow bugs, annelids, midges, and baetis patterns. It was great to see the Wyoming Game & Fish out on the Bighorn River checking every boat for licenses, AIS stickers, lifejackets, and proper permits. It is important that if you are going to float or fish any water in Wyoming that you check all regulations prior to your trip. These rules help protect us and keep our fishery healthy and productive for all of us to enjoy. To purchase a Wyoming Fishing license online go to our RATES & INFO page and your can follow the link to complete the process. It is an easy and convenient way to purchase your fishing license.